Tuesday • March 6 • 2012 Volume 79 • Number 10 INSIDE: Presorted Standard US Postage Paid Permit #8 ECRWSS Vermillion, SD Campbell’s Supply ? Sears ? Subway ? Employment ? Dining ? One In A VerMillion ? bp Broadcaster Press Postal Patron Local Since 1934 201 W. Cherry ? Vermillion, SD 57069 ? Phone: 605-624-4429 ? Fax: 605-624-2696 ? www.broadcasteronline.com LIMITED TIME ONLY! FREE LUXURY BLANKET EVENT ••••••••••••••••••••••••••••• Twin Mattress Full Mattress Queen Mattress Insight 1299 $ $ $ 79 149 124 Buy any Serta® Matress or Mattress Set $695 and above and receive a Free Sleep to GoTM by Serta® Luxury Fleece Blanket by mail. Quantities Limited. * *Offer redeemable by mail (not redeemable at retail). Offer valid only with proof of purchase of (i) any Serta® mattress or mattress set with an invoice price of $695 or more or (ii) any IComfort® mattress or mattress set purchase. Offer valid only at participating retailers and only on qualified purchases between 2/9/2012 and 3/13/2012. Quantifies limited. Visit www.serta.com for participating retailers and official terms and conditions. Advanced Comfort, Cushion Firm Support $ Twin XL Set $899.00 Full Set $1099.00 King Set $1699.00 FREE ONLY 25 Year Warranty! Local Delivery* IN-HOME 120 DAY RISK FREE* TRIAL! FREE In-Home Set Up* BUY ANY MATTRESS SET $499 & UP FREE Local Delivery & Set Up. . .$39 $ 183 FREE Disposal of Old Bed..........$20 TOTAL VALUE FREE 12 Month 0% Financing. .$64 FREE! FREE Ultra Plush Pillows............$64 FREE ONLY ONLY Removal* FREE BUY ANY SERTA MATTRESS SET $695 & UP FREE Local Delivery & Set Up......$39 $ 312 FREE Disposal of Old Bed............$20 TOTAL VALUE FREE 12 Month 0% Financing.....$64 FREE! 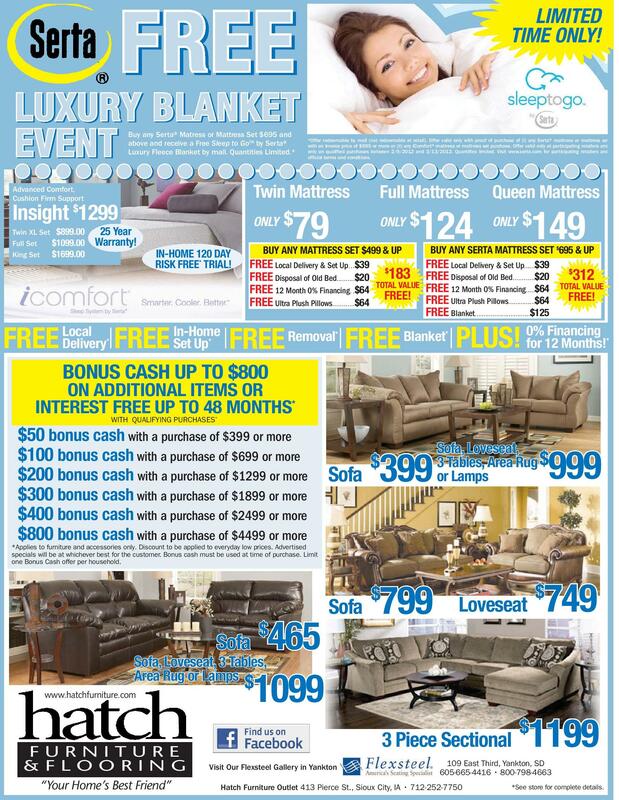 FREE Ultra Plush Pillows...............$64 FREE Blanket...............................$125 Blanket* PLUS! 0% Financing for 12 Months! * BONUS CASH UP TO $800 ON ADDITIONAL ITEMS OR INTEREST FREE UP TO 48 MONTHS* WITH QUALIFYING PURCHASES* $50 bonus cash with a purchase of $399 or more $100 bonus cash with a purchase of $699 or more $200 bonus cash with a purchase of $1299 or more $300 bonus cash with a purchase of $1899 or more $400 bonus cash with a purchase of $2499 or more $800 bonus cash with a purchase of $4499 or more Sofa 399 $ Sofa, Loveseat, 3 Tables, Area Rug $ or Lamps 999 *Applies to furniture and accessories only. Discount to be applied to everyday low prices. Advertised specials will be at whichever best for the customer. Bonus cash must be used at time of purchase. Limit one Bonus Cash offer per household. Sofa 799 $ 749 $ Loveseat 465 $ 1099 Sofa $ Sofa, Loveseat, 3 Tables, Area Rug or Lamps www.hatchfurniture.com FURNITURE &FLOORING “Your Home’s Best Friend” 3 Piece Sectional Visit Our Flexsteel Gallery in Yankton 1199 $ 109 East Third, Yankton, SD 605-665-4416 • 800-798-4663 Hatch Furniture Outlet 413 Pierce St., Sioux City, IA • 712-252-7750 *See store for complete details.